Lord Zion sends us this information about a new release. 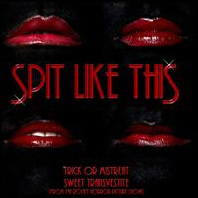 Fast forward to present day and my band, SPiT LiKE THiS, recently recorded a non-demo version of "Sweet Transvestite" - this is being released on October 20th as a double-A side with one of our own compositions, "Trick Or Mistreat" on the Transcend label via Cargo. Our version of ST is a faithful tribute to the original - we spent a lot of time, money and love on it and we hope that fans of the original will be open to our interpretation. Even the cover of the single (to be released as a CD single plus a limited edition 7" red vinyl!) is a tribute to the RHPS - albeit featuring the luscious 4 lips of us 4 band members! It is our hope and ambition to break into the Top 40 with this double A side! We've had a listen and it's sounding good! I've also had a look around their website, nice images of the band. Use the widget to the left to have a listen yourself, or to buy a copy of the track on download.